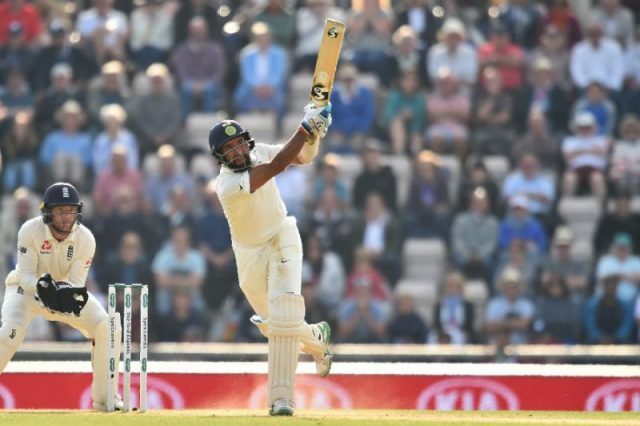 Cheteshwar Pujara’s painstaking and brave century gave India a narrow lead on the second day of the fourth Test after England off-spinner Moeen Ali took five wickets at Southampton on Friday. Pujara’s near six-hour 132 not out was the cornerstone of India’s 273, made in reply to England’s first-innings 246. Ali took five wickets for 63 runs in 16 overs — his second successive five-wicket innings haul in a Test against India at Southampton following a return of six for 67 in 2014. Alastair Cook and Keaton Jennings batted out four overs as England reached stumps on six without loss in their second innings — a deficit of 21 runs. Ishant Sharma survived the hat-trick at the start of Ali’s next over before he too fell to the all-rounder. Pujara, now on 96, now had only No 11 Jasprit Bumrah for company. But a swept two off Ali took him to 99 and he then survived the bowler’s review for lbw after third umpire Joel Wilson ruled he had been playing a shot. Pujara fielded, but did not attend the post-match press conferences. Pujara’s response was to launch Stuart Broad for four over midwicket and next ball drive him through the covers for another boundary. James Anderson, England’s all-time leading Test wicket-taker, needed six more wickets to equal retired Australia great Glenn McGrath’s mark of 563 — the most taken by any fast bowler at this level. But after lunch, Sam Curran, who had already marked his return to the team with a Test-best 78 that rescued England from the depths of 86 for six on Thursday, dismissed Kohli, who during his innings passed 6,000 runs in Tests. The 20-year-old Surrey left-arm swing bowler angled a delivery across star batsman Kohli who, in a rare error, pushed away from his body and saw the ensuing edge well caught low at first slip by Cook. A minor recurrence of all-rounder Stokes’s knee injury led to doubts over his ability to bowl at Southampton and a fresh rejig of England’s team. But the paceman’s first legitimate delivery on Friday saw Pujara, on 50, edge just beyond Buttler’s grasp. Stokes had better luck when a desperately close call for a no-ball went his way after he had Ajiknya Rahane lbw for 11. Ali removed Rishabh Pant and Hardik Pandya either side of tea. Ravichandran Ashwin then inexplicably tried to reverse sweep his opposing off-spinner and played on, before Ali’s next ball clean-bowled Mohammed Shami.